We have come a long way from Nintendo's September 2017 Nintendo Direct which debuted Kirby Battle Royale. We all seemed to instantly want the game. Then, we actually learned what was in the game... which isn't much. We thought it would be the closest thing to a Kirby fighting game with online multiplayer, and it's really just a party game with one mode being the fighting part. Some time ago, they released a free demo of Kirby Battle Royale on the 3DS eShop which features “demo tickets”, or treating the demo as a wait-to-play game. You can play three modes with it, and in your choice of free-for-alls or teams: Battle Arena, Apple Scramble, and Crazy Theater. Battle Arena is the fighting mode and it's quite shallow. Apple Scramble features you trying to attack Whispy Woods to get apples to fall down, and then you throw the apples down a trap door. Get more apples than your opponents. And Crazy Theater asks you to do things like stand on a panel on the ground that answers a prompt, or avoidance tasks, or whatever, and do that successfully enough times to win. Without depth, there isn't any point to getting the game as THE game our staff will all play, so we decided on Rocket League instead. (In case you were wondering, we haven't played Rocket League a single time since we got it weeks ago.) I wanted this article to be about the result of the Kirby Copy Ability Poll final round, but Nintendo decided they won't reveal the results yet because they want Kirby Battle Royale to have some legs past its release day. Fair enough, I guess. Because we'll definitely write about the result whenever it's announced. We'll just remind you that Kirby Battle Royale isn't worth $40 and that we're all looking forward to Kirby Star Allies on the Nintendo Switch, releasing in a few months. Meanwhile, Nintendo followed through on putting Mirror Kirby up as a free theme on the Nintendo 3DS theme shop. The Mirror Kirby 3DS home menu theme looks a lot better than the Mirror Kirby desktop wall paper. It's free, so you might as well download it. The sound effect for launching a game or application is when Kirby obtains a Copy Ability in Kirby Super Star. Pretty neat. You can bet if some other ability won that wasn't introduced in Kirby Super Star, you wouldn't get music from Kirby Super Star. 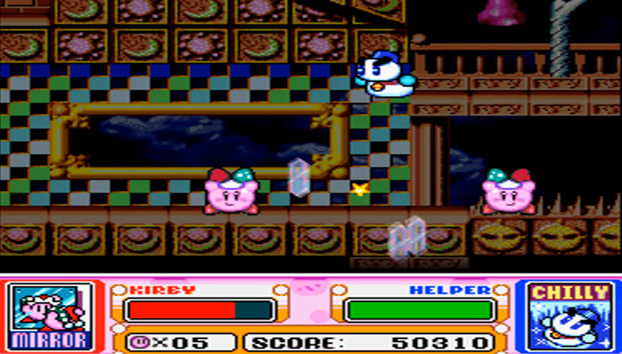 That said, Simirror (the Mirror-granting enemy) and the Mirror ability don't first appear in the Marshmallow Castle level of Kirby Super Star, which is stage 2 within the sub-game Dyna Blade. They first appear in the first sub-game, Spring Breeze, in stage 3, known as Bubbly Clouds. Screengrab from RockmanKenny's walkthrough of Spring Breeze. Photo taken from Ludwig's 3DS as he was playing the game to see when Simirror first appeared. Marshmallow Castle, weirdly enough, was renamed to Mallow Castle in Kirby Super Star Ultra. Anyway, why is the theme Marshmallow Castle instead of Bubbly Clouds? Well, while Simirror and Mirror first appear in Bubbly Clouds, it's sort of a throwaway appearance. 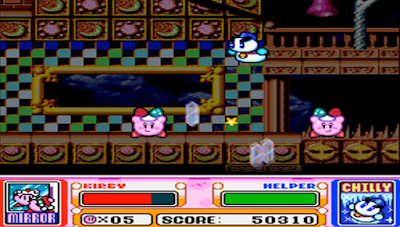 Simirror doesn't appear again until Marshmallow Castle, where the Mirror ability is the most straight-forward and immediate solution to unlock a secret passage to get access to a hidden bonus level, Trial Room 1.
if he uses the Mirror ability's Reflect Force attack, the mirrors will reach the bomb block and reveal a door to the Trial Room 1 Switch. Unlocking a secret bonus stage filled with free Copy Essences so you can choose which ability you want (including Mirror) is a lot more memorable for Mirror than one random appearance where a Simirror happens to be standing around, so that is why they picked Marshmallow Castle as the background music. Besides, Bubbly Clouds gets enough attention throughout the series. What's that? An article about Kirby Battle Royale stopped paying attention to Kirby Battle Royale? Well, good riddance. When the Kirby 25th Anniversary Copy Ability poll final round winner ends up getting announced, anticipate an article devoted to just that. KoopaTV doesn't spend enough time talking about Kirby's franchise, anyway. If you have any thoughts on Kirby Battle Royale now that it is released, feel free to share them. By the way, important programming note: KoopaTV will give details on a mini-contest tomorrow on Saturday that lasts the weekend, so don't forget to check KoopaTV during the weekend! Here is the mini-contest article! Here is the article devoted to just the final round winner: Sleep Kirby! Just two months later, a much better Kirby game released. The article was much more enthusiastic. I can't say I was ever really that excited for this game. While I did enjoy some of the other spin-off titles, Battle Royale was just never appealing to me perhaps because it seemed like a downgraded Smash game. I'm still highly interested in Kirby Star Allies, though, and I hope that some manifestation of Dark Matter will appear in it. It's absolutely nothing like Super Smash Bros. and it's closer to Mario Party, but with a fraction of the minigames at around the same depth. The difference is that your playable characters have different abilities instead of being model-swaps, but I don't think that's compelling enough. I can't find the 3DS theme on the Eshop. I tried looking in both the Free and Kirby sections, but nothing. Did they take it off the shop? I have the first 3DS model, so that might be the problem. Of course, it's still in my "Theme Collection" since that's the listing of all the themes I have downloaded on my SD card. It...appears to have been a seasonal, limited-time theme, which is really disappointing since it's the theme that I still have to this day on my 3DS. I can contact Nintendo support and find out for sure, though. Would you like that? I can tell you it was definitely in the Theme Shop at one point, and not some My Nintendo reward. ...so yeah if Nintendo lies then I do want to ask them about it. Miitomo's End of Life. ...What's Miitomo, Again? Nintendo Pitch: Abort the Port Support! Watch Kamek Stream Yooka-Laylee; January 2018!